Venus’s unusually thick atmosphere is typically regarded as a barrier that prevents us from gazing upon its tortured surface. By studying subtle shifts in weather patterns, however, scientists have learned that these clouds also offer important clues as to what lies beneath. New research published in the Journal of Geophysical Research shows there’s another way to study the topography of this mysterious planet, and that’s by looking at the very thing that’s obscuring its surface: clouds. Using radar and infrared light, the researchers managed to pierce our nearest planetary neighbor’s oppressive atmosphere and peer below. Like Earth, Venus features mountain ranges, canyons, rift valleys, and vast plains. And like our planet, these surface features influence weather. Weather is markedly different on Venus than it is on Earth, and scientists are now starting to get a handle on just how weird it is. Owing to a greenhouse effect, the surface of Venus is a scorching 450 degrees Celsius. Ground-level winds are achingly slow, moving at just three feet a second. But things are different higher up, where winds reach upwards of 30 to 45 miles per hour, and where temperatures reach a more manageable and Earth-like -70 degrees Celsius (-94 degrees Fahrenheit). Even higher up, near the top of the 12-mile-thick atmospheric layer, the winds blow hundreds of times faster than they do on the surface. Using the Venus Express Satellite, an international team of astronomers, including a team from the Max Planck Institute in Germany, studied three different aspects of the planet’s cloudy weather, namely the speeds at which these clouds circulate, the amount of water locked up in these clouds, and the brightness of these clouds across the visual spectrum (particularly in ultraviolet light). Together, these three aspects could be connected to surface features below. To explain this effect, the researchers point to a phenomenon known as gravity waves, which shouldn’t be confused with gravitational waves. (Those are very different). As the waves break, they push back against the fast-moving high-altitude winds which slow them down. This results in a wind circulation system that functions like an air pump; water-rich air is thrown up into the atmosphere, creating the “fountain” and a resulting downwind plume of vapor. 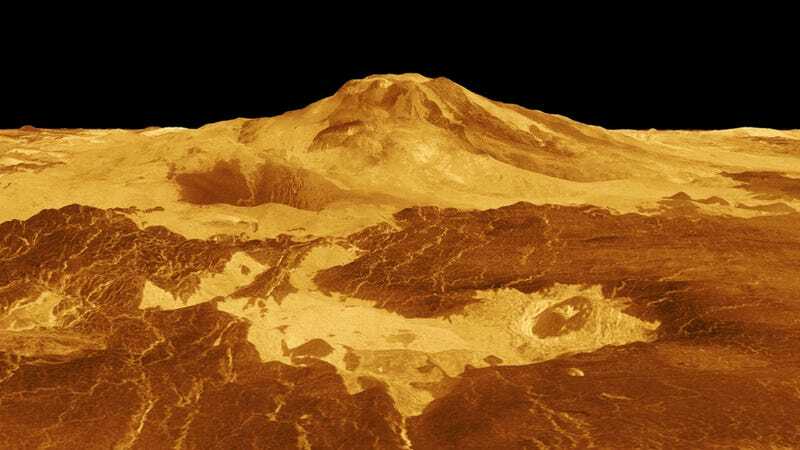 Similar effects were observed along other mountainous regions along Venus’s equator, where the warmer temperatures fuel this particular weather feature. This research is important—and not just because it improves our understanding of Venus. The new details also enhance our understanding of climate as well. Our planet is steadily warming due to the steady release of greenhouse gasses, so it would behoove us to learn as much about this stifling hot planet as possible.